Li'l Chuck The One Man Skiffle Machine is preparing to release his long awaited second album "Utility Blues". Li'l Chuck's 'Utility Blues' Album pre-sale party will give you the opportunity to get your name down in advance and have the album delivered to your door when it is released. You can also have the have the chance to grab some of his new merchandise or even your own personal Li'l Chuck concert!. Come hear all his new album tracks and the old favourites in his favourite live music venue Bluesmoke. 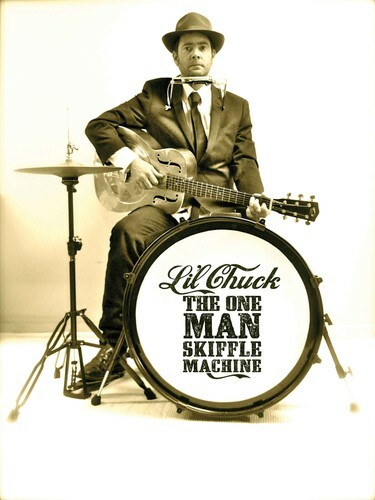 Li'l Chuck The One Man Skiffle Machine is an authentic one man band performing 'good time music with old time style'. Blessed with the ability to handle multiple instruments at a time, he is the master of coordination: blowin', suckin' and pluckin' simultaneously! He cranks out the harmonica, resonator guitar, kick drum, hi-hat, kazoo and vocals to give the audience a rollicking good time. Originally hailing from the UK, Li'l Chuck first stomped out his music in Christchurch, New Zealand after relocating in 2003.